If your home has more children than it does bedrooms, chances are your kiddos are sharing a room for the time being. With a shared bedroom also comes shared closet space. This can present its own set of challenges as you strive to provide each kid with their own space within the shared area. 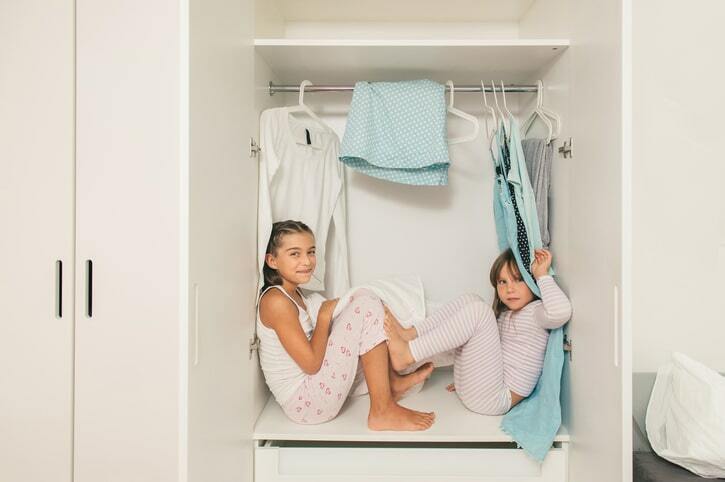 The experts at More Space Place of Sarasota, Bradenton, and Port Charlotte can help you navigate this tricky situation, helping ensure you’re making the most of your kids’ shared closet and keeping things as organized as possible. The first thing we recommend is to do a complete closet cleanout. If you want to maintain a balance of space between your kids, it’s important to start with a clean slate. This is especially true if one child was previously occupying the room before the other got moved in, as they likely already had things in the closet. Kids also grow out of clothes and toys so quickly that chances are there are a lot of things in there that aren’t being used anymore. Setting aside some time one day to take everything out of the closet, go through it, and get rid of things your kids no longer use will start this arrangement out on the right foot. Once you have everything moved out of the closet and pared down to what will be going back in, you can figure out a way to divide the space between your kids in a way that’s fair. If there’s a big height difference, maybe the taller child can use the higher shelves and the lower shelves can be designated space for the shorter sibling. Another option is to just divvy up the space down the middle. Of course, the layout of the closet will determine some of this, and each situation will be different. The main objective will be to just make sure each kid feels like they have their own fair share of the closet space to use for their things. The final step in creating an effective shared closet space for your kids is to have them help organize their things once the space is ready to be filled. They can arrange things the way they like, which will also help ensure they know where everything goes. This can also be a good way to get them in the habit of maintaining a tidy space, making sure things get put away after they’re used. Kids are often on the go, and having their own designated closet space can be a great way to preserve some order for them. To learn more about how we can help you enhance the storage and organization in your home, contact More Space Place today! You can also visit one of our convenient showrooms in Sarasota, Bradenton, and Port Charlotte to see some of our products in person. If the closet setup you have now just doesn’t serve you the way you need, maybe it’s time to consider installing your own custom closet system. Whatever your needs are, we can help create the perfect solution for you! Whether you’re getting ready for work in the morning or for a night out on the town, finding the right outfit can be difficult when your closet is in a state of disarray. 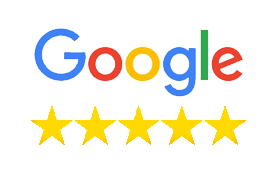 With More Space Place of Sarasota, Bradenton, and Port Charlotte, our custom closets can help you organize everything from your coats to your handbags, giving you back time and energy to dedicate to other things. Before storing your handbags, it is important to properly protect them to help prolong the longevity of your accessories. Stuffing your handbags with tissue paper, particularly larger ones, will help them to keep their shape and prevent unseemly wrinkles from developing over time. When storing your purses you will also want to consider the use of dust bags. These protective cloth coverings will help to maintain the luster of your bags by keeping dust and other contaminants away from their surfaces. Dust bags will also help to protect beaded bags from being caught on other items when being removed from a shelf. They will similarly protect high-gloss bags from scuffing as a result of their sticky surfaces dragging across other handbags. Depending on your personal preference, organizing your bags by size or color will make them easy to find, and simple to sort through and select for an occasion. Whether you prefer locating a color first and then a size and style, or vice versa, both of these methods will allow you to find a handbag to fit your outfit and the event you are attending with little to no hassle. There are so many ways to organize your handbags in a custom closet. You could choose to place them in a shelving unit, where they would be nice and visible for your perusal. You could also place them into individual cubbies to keep them separated from one another. A tall cubby could also be installed with individual hooks from which you could hang your handbags to help them maintain their shape. Another great way to store your bags, especially smaller ones like clutches and wristlets, is to have space created in your custom closet to hold little baskets. These will help to keep your small bags organized and provide a level of protection from dust and debris. If you’re ready to organize your closet and find a home for all of your handbags, then contact More Space Place today! We are located in Sarasota, Bradenton, and Port Charlotte, and we would love to talk with you about your design goals during a free, in-home consultation. We look forward to hearing from you! Having an organized bedroom closet can seem like a distant dream to some homeowners in the Sarasota, Bradenton, and Port Charlotte areas. However, with custom closet systems from More Space Place, the concept of an organized bedroom closet is well within your reach. Feel free to pick and choose from the following 10 closet organization ideas to transform your bedroom closet into something truly special. Start your organization process by going through your closet and getting rid of the things you never wear. Donate items in good condition to a local thrift store or charity. Organize the clothes you are keeping into four groups: most used, least used, seasonal/specialty items (evening wear, etc.) and accessories. Your most-worn clothing should be placed at eye level in an area that’s easy to access. Everything else should be arranged in a way that makes sense to your tastes, preferences, and wardrobe. Treat your closet like a small room as you plan and design custom closet solutions. Consider the flooring, new paint color for the walls, lighting, and additional touches to really make it your own. Custom shelving in your closet can make the storage of hats, handbags, shoes, and other accessories easy and convenient. Adding storage boxes with lids to some shelves can be ideal for storing smaller accessories and specialty items. Utilize dividers in boxes to keep track of the smallest items. 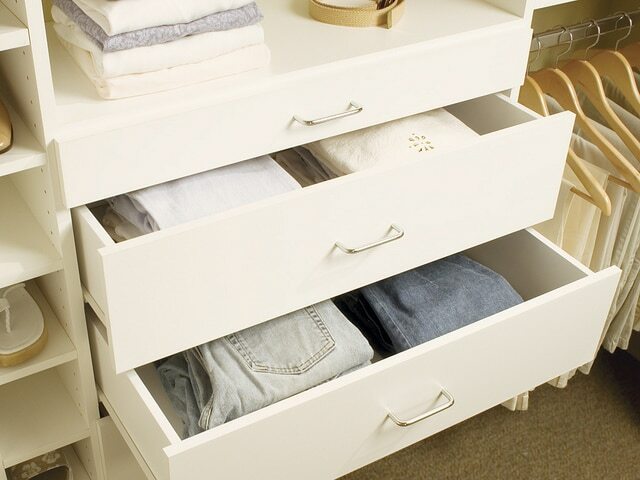 If your closet space allows, include built-in drawer storage for jeans, sweaters, casual shirts, and other folded items. 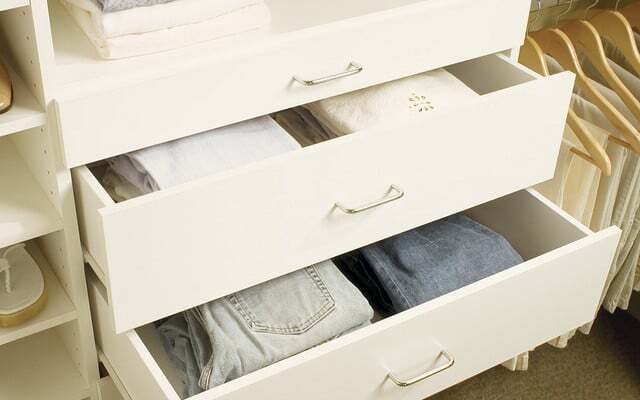 These drawer systems can often eliminate the need for a dresser. Run shelving, accessory racks, and other custom storage elements from the floor to the ceiling to maximize the space in your closet. Storing seasonal or seldom-used items higher up increases a closet’s efficiency. The space above the highest closet rod near the ceiling is ideal for storing seasonal items or even extra linens, pillows, and blankets. Make the most of every square inch of your closet by placing hooks in those tucked away areas that can be used for hanging things. When it’s time to put your wardrobe back in your finished custom closet, consider grouping like items by color. You’ll have an easier time finding your favorite pieces of clothing, as well as be better able to use a designer’s approach in creating color palettes, looks, and outfits. If you store your luggage in your closet, make the most of it by using the space inside. Seasonal items, such as coats and sweaters, as well as spare blankets and linens are just a few ideas. If space allows, consider adding bench seating and a small vanity to create a boutique feel in your closet. Select a cedar chest or similar box to allow your bench seating to also function as additional storage. If it’s time to finally manifest the closet of your dreams, these 10 storage and design hacks can help make it happen. Contact More Space Place today for a free in-home consultation, or visit one of our convenient showrooms in Sarasota, Bradenton, or Port Charlotte! An increasing number of Bradenton homeowners are looking to go beyond simple closet storage to create something truly special in their bedroom closets. 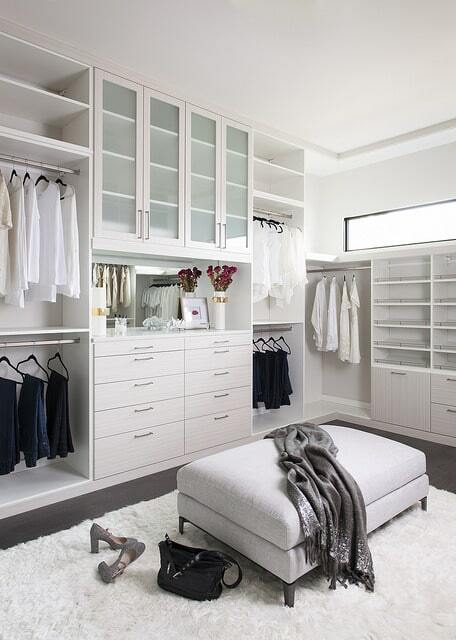 Custom closets are the ideal way to accomplish this. Whether you have enough space for a walk-in style or are looking to take a smaller reach-in closet to new heights, More Space Place of Sarasota, Bradenton, and Port Charlotte can help create a custom closet design perfect for you. A boutique-style design is a popular type here in homes on the Gulf Coast. To start getting inspiration for your own space, we’ve provided the following list of some of the essential elements of a boutique-style closet. What style of closet would you like? Browse designer stores and boutiques online or in person to get ideas. This will help you to determine the overall “vibe” of your boutique-style closet. Along with the theme, style, and layout of your closet, your chosen color palette will contribute significantly to the look. White, neutral, or pastel choices help to create a setting that will be conducive to design unity no matter how big and varied your wardrobe may become. However, you can also go with a richer brown or other wood-tone finish. More Space Place offers a variety of colors and finish options for your closet elements. If space allows, include a chair or bench in the design layout. This may take the form of a small mirror, built-in dresser and ornate chair, or a cushioned window seat. While not essential, seating can help to transform your closet from a mere storage area to a luxurious haven of style and relaxation. The best part about custom closet solutions is you can get exactly what you want! Design all of the elements of your closet storage area to fit your particular needs and preferences. Do you have more shoes than blouses? 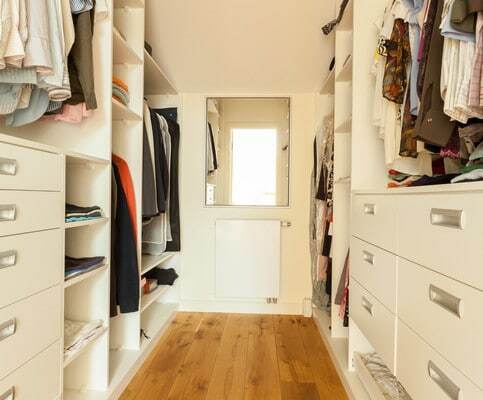 Be sure your closet design reflects this. 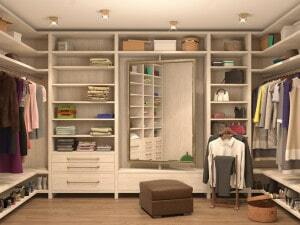 You can customize every detail of your closet system with custom elements. Anything is possible when it comes to designing your custom closet. Add details such as hanging pegs or hooks for belts and scarves, as well as plenty of adjustable shelving and cabinetry for bags, purses, hats and other accessories. For added elegance, consider adding a showpiece chandelier or light fixture overhead. Is jewelry a prominent part of your wardrobe? If so, and if space allows, include an area in your Bradenton home’s custom closet to store and display your jewelry. This can also help keep your valuable items safe. Details like these help to personalize your custom closet and take closet organization to a new level. Your home is like your castle, and you deserve to live in a space that embodies all the elements of your personal style. A custom boutique-style closet can become a peaceful and useful sanctuary in your home. To get started, contact More Space Place Bradenton today to schedule a free in-home consultation! Achieving an organized lifestyle often stems from having an organized and orderly home. If you feel relaxed and put together in your own space, the feeling can filter out into other areas of your everyday life. 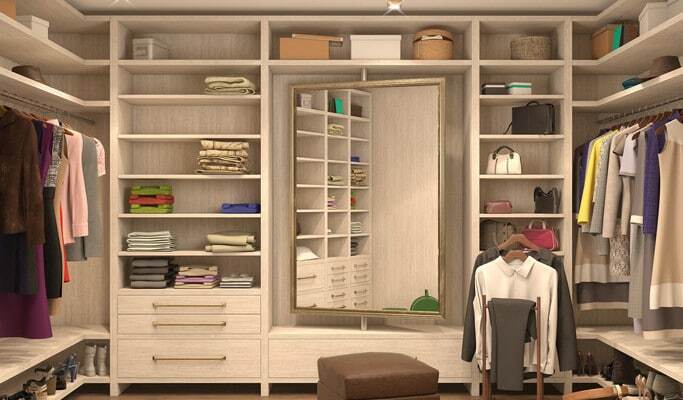 At More Space Place Sarasota, we are big believers in the power of a custom closet solution. This storage method is the most efficient and effective way to maximize all your available space, and it’s completely designed around your individual needs. Here we’ll explore three ways a custom closet can improve your life. 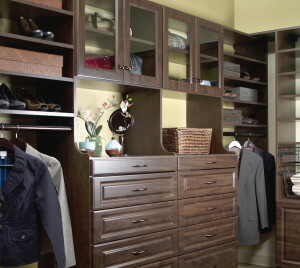 One way a custom closet can help improve your life is by streamlining your morning routine. For many Sarasota residents, the morning is the most hectic time of day. Between getting the kids ready for school, getting ready for work, and organizing your list of errands, any way you can get relief in the morning is helpful. 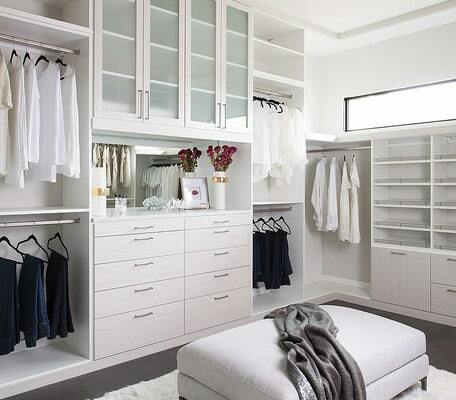 A custom closet can make getting ready in the morning a lot easier. Designing a personalized storage system for your wardrobe and accessories will help you keep track of everything and ensure you can find what you need when you need it. Implement an adjustable shelving system that can modify as your needs change. Belt racks, jewelry drawers and dividers, and built-in drawers and cabinetry all work together to create an efficient and organized closet system to streamline your morning routine. 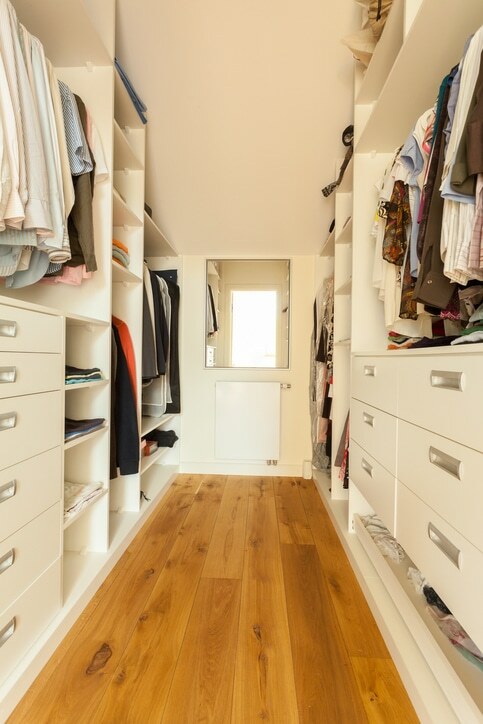 Another benefit of a custom closet is it can minimize the time it takes you to clean and pick up your space. When everything has a designated place, putting laundry away, hanging your coats, and tidying up takes less time. Spending less time cleaning leaves more time for the things you want to be doing. In addition to making it easy to clean, a custom closet also helps your bedroom maintain its organization. With easy access to storage, keeping your space tidy takes minimal effort. It becomes more convenient and less of a chore. A third way in which a custom closet will improve your life, one that’s typically overlooked, is it can help save you money over time. With more space for your clothes to hang and fold, your belongings will stay wrinkle-free and in better shape for longer. This means fewer trips to the dry cleaners and fewer replacement purchases. It will keep everything either in view or easy to find, which will also prevent duplicate purchases. The three points mentioned above are not the only ways a custom closet can improve your life. To learn more or to schedule a free in-home design consultation, call the experts at More Space Place Sarasota today! We look forward to working with you and helping you create the perfect custom closet for your storage needs and personal style.